Sparkling blue seas, the silhouette of flukes before they are slammed into the water, billows of white foam. Whales we did not expect to see. We had travelled up to the West coast National Park to catch the end of the flowering season and a million tortoises, only to find the area barred by a padlocked gate. As its a military controlled zone, it’s only open in August and Sep, which we had missed by a day. Our planned lunch stop at Groote Post was also closed. Wild Peacock ensured we still had a great, if late, lunch where Terry could still get the bits she wanted for her evening function. On a a gorgeous day, .. Drove around the coastline. Red velvet cupcakes in Kalk bay, Hout Bay, V & A, and then back to the winelands for a long walk through the vineyards with Polly. Her legs are a bother and she has been happy to do her cappuccino visits and sleep in the sun. Unless there is mischief on offer! 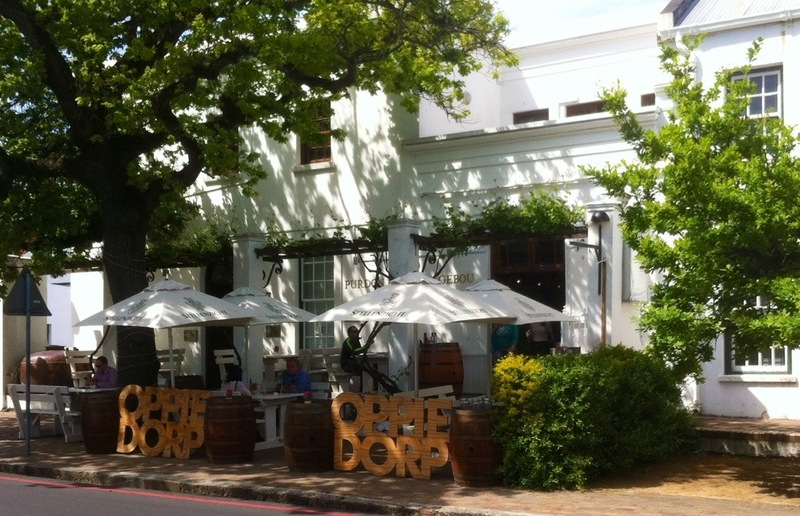 David and Heather have a new spot in Stellenbosch, Oppie Dorp, where they have been frequently enough to have a preferred spot and are known by the staff. Away from the breezy front door, which on a chilly evening is important, in the red wine room. You are allowed to bring a bottle of wine without being charged corkage, which is unusual but great, and the wine list has an interesting selection most of which were from estates I did not know. Our starters were excellent. Duck breasts with curry and litchi, a Cape Malay twist. The sole was a tad disappointing, the lamb shanks tender and delicious, which went well with the Beau Belle – a new boutique wine and olive farm in the Stellenbosch Valley – Shiraz. They certainly weren’t shy with the salad! Service was friendly, if a bit slower than was comfortable. A fun, relaxed spot that will see us again. In the garden at the cottage, the protea are in full flower and the air is still heady with jasmine. Perfect for braai time, even if its still too cool to sit out and eat. I did manage, somehow, to burn my arm. Gaps filled in the garden beds that will hopefully survive the moles. The water feature near the patio has started life. One of the decisions made in France, as we so enjoyed having the sound of water from the small fountain they had in a garden tub. It has also sorted the piece of garden outside our window that was struggling. A visit to the Bartinney Wine and Champagne Bar that we have walked past a dozen times. The abundance of protea flowers on display, magnificent. The inability to get a glass of bubbles confounding.